All the videos on this website are free for viewing. If you would like to purchase downloads of the videos on this site, visit Buy Downloads for access the the Digital ToyBox. By popular demand, honestly! Many ToyBox Tales are available on high resolution DVDs for easier presentation in children’s church or where ever you are showing these. 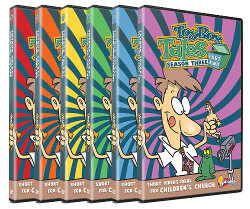 For a complete line of ToyBox Tale DVDs visit the ToyBox Tale area of the Kidology.org Online Store! You can order by individual season or save with the 6 DISC BUNDLE! The Christmas Story like you’ve never heard it before! As soon as the debut of Toybox Tales hit the web, we got requests for the Jesus action figure Karl uses in many of the Tales. He had gotten one as a gift, and didn’t know where to find it for awhile, but alas, Jesus has been found, and is now available! I hate to say this, but, YOU CAN BUY JESUS TODAY! So begins Karl Bastian’s novel, Order of the Ancient, available exclusively at Kidology.org. The story is inspired by epic tales enjoyed since childhood, possessing the adventure that will engage today’s middle to upper elementary children. Containing elements of the great stories of old — good vs. evil, ancient tradition, young heroes mentored by wiser sages, supernatural powers and miracles, mystery, and great battles — Order of the Ancient allows kids to imitate the characters, resulting in their ongoing practice of the Spiritual Disciplines. QUICK & EASY: YOU CAN BUY ACCESS TO DOWNLOAD ALL THE VIDEOS ON THIS SITE. If you would like to purchase access to ALL the ToyBox Tales on this site, please simply send a donation via PayPal using the choices to the right. (You do not need to have a PayPal account to make a payment. )$20 is the basic fee, however, if this is for church use and you have afford it, we’d appreciate a $30 gift. We even added a $50 option for those who want to really bless us and help cover the significant hosting costs of maintaining this site.